For the French-Canadian film, see Far Side of the Moon (film). For other uses, see Dark side of the Moon. 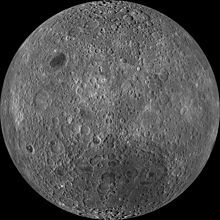 The far side of the Moon is the hemisphere of the Moon that always faces away from Earth. The far side's terrain is rugged with a multitude of impact craters and relatively few flat lunar maria. It has one of the largest craters in the Solar System, the South Pole–Aitken basin. Both sides of the Moon experience two weeks of sunlight followed by two weeks of night; the far side is sometimes called the "dark side of the Moon", meaning unseen rather than lacking light. About 18 percent of the far side is occasionally visible from Earth due to libration. The remaining 82 percent remained unobserved until 1959, when it was photographed by the Soviet Luna 3 space probe. The Soviet Academy of Sciences published the first atlas of the far side in 1960. The Apollo 8 astronauts were the first humans to see the far side with the naked eye when they orbited the Moon in 1968. All manned and unmanned soft landings had taken place on the near side of the Moon, until 3 January 2019 when the Chang'e 4 spacecraft made the first landing on the far side. Astronomers have suggested installing a large radio telescope on the far side, where the Moon would shield it from possible radio interference from Earth. Tidal forces from Earth have slowed down the Moon's rotation to the point where the same side is always facing the Earth—a phenomenon called tidal locking. The other face, most of which is never visible from the Earth, is therefore called the "far side of the Moon". Over time, some parts of the far side can be seen due to libration. In total, 59 percent of the Moon's surface is visible from Earth at one time or another. Useful observation of the parts of the far side of the Moon occasionally visible from Earth is difficult because of the low viewing angle from Earth (they cannot be observed "full on"). The phrase "dark side of the Moon" does not refer to "dark" as in the absence of light, but rather "dark" as in unknown: until humans were able to send spacecraft around the Moon, this area had never been seen. While many misconstrue this to think that the "dark side" receives little to no sunlight, in reality, both the near and far sides receive (on average) almost equal amounts of light directly from the Sun. However, the near side also receives sunlight reflected from the Earth, known as earthshine. Earthshine does not reach the area of the far side that cannot be seen from Earth. Only during a full Moon (as viewed from Earth) is the whole far side of the Moon dark. The word "dark" has expanded to refer also to the fact that communication with spacecraft can be blocked while the spacecraft is on the far side of the Moon, during Apollo space missions for example. The two hemispheres of the Moon have distinctly different appearances, with the near side covered in multiple, large maria (Latin for 'seas,' since the earliest astronomers incorrectly thought that these plains were seas of lunar water). The far side has a battered, densely cratered appearance with few maria. Only 1% of the surface of the far side is covered by maria, compared to 31.2% on the near side. One commonly accepted explanation for this difference is related to a higher concentration of heat-producing elements on the near-side hemisphere, as has been demonstrated by geochemical maps obtained from the Lunar Prospector gamma-ray spectrometer. While other factors, such as surface elevation and crustal thickness, could also affect where basalts erupt, these do not explain why the far side South Pole–Aitken basin (which contains the lowest elevations of the Moon and possesses a thin crust) was not as volcanically active as Oceanus Procellarum on the near side. It has also been proposed that the differences between the two hemispheres may have been caused by a collision with a smaller companion moon that also originated from the Theia collision. In this model, the impact led to an accretionary pile rather than a crater, contributing a hemispheric layer of extent and thickness that may be consistent with the dimensions of the far side highlands. The far side has more visible craters. This was thought to be a result of the effects of lunar lava flows, which cover and obscure craters, rather than a shielding effect from the Earth. NASA calculates that the Earth obscures only about 4 square degrees out of 41,000 square degrees of the sky as seen from the Moon. "This makes the Earth negligible as a shield for the Moon [and] it is likely that each side of the Moon has received equal numbers of impacts, but the resurfacing by lava results in fewer craters visible on the near side than the far side, even though both sides have received the same number of impacts." Newer research suggests that heat from Earth at the time when the Moon was formed is the reason the near side has fewer impact craters. The lunar crust consists primarily of plagioclases formed when aluminium and calcium condensed and combined with silicates in the mantle. The cooler, far side experienced condensation of these elements sooner and so formed a thicker crust; meteoroid impacts on the near side would sometimes penetrate the thinner crust here and release basaltic lava that created the maria, but would rarely do so on the far side. Until the late 1950s, little was known about the far side of the Moon. Librations of the Moon periodically allowed limited glimpses of features near the lunar limb on the far side, but only up to 59% of the total surface of the moon. These features, however, were seen from a low angle, hindering useful observation. (It proved difficult to distinguish a crater from a mountain range.) The remaining 82% of the surface on the far side remained unknown, and its properties were subject to much speculation. 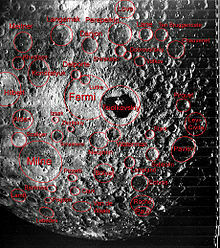 An example of a far side feature that can be seen through libration is the Mare Orientale, which is a prominent impact basin spanning almost 1,000 km (600 miles), yet this was not even named as a feature until 1906, by Julius Franz in Der Mond. The true nature of the basin was discovered in the 1960s when rectified images were projected onto a globe. The basin was photographed in fine detail by Lunar Orbiter 4 in 1967. Before space exploration began, astronomers did not expect that the far side would be different from the side visible to Earth. On October 7, 1959, the Soviet probe Luna 3 took the first photographs of the lunar far side, eighteen of them resolvable, covering one-third of the surface invisible from the Earth. The images were analysed, and the first atlas of the far side of the Moon was published by the USSR Academy of Sciences on November 6, 1960. It included a catalog of 500 distinguished features of the landscape. A year later, the first globe (1:7007136000000000000♠13600000 scale) containing lunar features invisible from the Earth was released in the USSR, based on images from Luna 3. 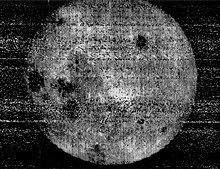 On July 20, 1965, another Soviet probe, Zond 3, transmitted 25 pictures of very good quality of the lunar far side, with much better resolution than those from Luna 3. In particular, they revealed chains of craters, hundreds of kilometers in length, but, unexpectedly, no mare plains like those visible from Earth with the naked eye. In 1967, the second part of the Atlas of the Far Side of the Moon was published in Moscow, based on data from Zond 3, with the catalog now including 4,000 newly discovered features of the lunar far side landscape. In the same year, the first Complete Map of the Moon (1:7006500000000000000♠5000000 scale) and updated complete globe (1:7007100000000000000♠10000000 scale), featuring 95 percent of the lunar surface, were released in the Soviet Union. As many prominent landscape features of the far side were discovered by Soviet space probes, Soviet scientists selected names for them. This caused some controversy, and the International Astronomical Union, leaving many of those names intact, later assumed the role of naming lunar features on this hemisphere. On April 26, 1962, NASA's Ranger 4 space probe became the first spacecraft to impact the far side of the Moon, although it failed to return any scientific data before impact. The first truly comprehensive and detailed mapping survey of the far side was undertaken by the American unmanned Lunar Orbiter program launched by NASA from 1966 to 1967. Most of the coverage of the far side was provided by the final probe in the series, Lunar Orbiter 5. The backside looks like a sand pile my kids have played in for some time. It's all beat up, no definition, just a lot of bumps and holes. It has been seen by all crew members of the Apollo 8 and Apollo 10 through Apollo 17 missions since that time, and photographed by multiple lunar probes. Spacecraft passing behind the Moon were out of direct radio communication with the Earth, and had to wait until the orbit allowed transmission. During the Apollo missions, the main engine of the Service Module was fired when the vessel was behind the Moon, producing some tense moments in Mission Control before the craft reappeared. Geologist-astronaut Harrison Schmitt, who became the last to step onto the Moon, had aggressively lobbied for his landing site to be on the far side of the Moon, targeting the lava-filled crater Tsiolkovskiy. Schmitt's ambitious proposal included a special communications satellite based on the existing TIROS satellites to be launched into a Farquhar–Lissajous halo orbit around the L2 point so as to maintain line-of-sight contact with the astronauts during their powered descent and lunar surface operations. NASA administrators rejected these plans on the grounds of added risk and lack of funding. The China National Space Administration's Chang'e 4 made the first soft landing on the lunar far side on 3 January 2019. The craft included a lander equipped with a low-frequency radio spectrograph and geological research tools. Because the far side of the Moon is shielded from radio transmissions from the Earth, it is considered a good location for placing radio telescopes for use by astronomers. Small, bowl-shaped craters provide a natural formation for a stationary telescope similar to Arecibo in Puerto Rico. For much larger-scale telescopes, the 100-kilometer-diameter (60 mi) crater Daedalus is situated near the center of the far side, and the 3-kilometer-high (2 mi) rim would help to block stray communications from orbiting satellites. Another potential candidate for a radio telescope is the Saha crater. Before deploying radio telescopes to the far side, several problems must be overcome. The fine lunar dust can contaminate equipment, vehicles, and space suits. The conducting materials used for the radio dishes must also be carefully shielded against the effects of solar flares. Finally, the area around the telescopes must be protected against contamination by other radio sources. The L2 Lagrange point of the Earth–Moon system is located about 62,800 km (39,000 mi) above the far side, which has also been proposed as a location for a future radio telescope which would perform a Lissajous orbit about the Lagrangian point. One of the NASA missions to the Moon under study would send a sample-return lander to the South Pole–Aitken basin, the location of a major impact event that created a formation nearly 2,400 km (1,500 mi) across. The force of this impact has created a deep penetration into the lunar surface, and a sample returned from this site could be analyzed for information concerning the interior of the Moon. 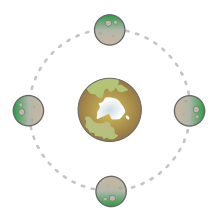 Because the near side is partly shielded from the solar wind by the Earth, the far side maria are expected to have the highest concentration of helium-3 on the surface of the Moon. This isotope is relatively rare on the Earth, but has good potential for use as a fuel in fusion reactors. Proponents of lunar settlement have cited the presence of this material as a reason for developing a Moon base. Some conspiracy theorists, notably Milton William Cooper, have alleged that some Apollo astronauts had seen UFOs on the far side of the Moon but were told to keep quiet about them. Some have allegedly reported seeing an alien base (code named "Luna") and even encountered aliens who told them to stay off the Moon. Some photographs circulated on the Internet purport to show a large "castle" on the Moon. The Apollo 20 hoax claims that a manned mission landed on the far side. NASA states that these claims are hoaxes. Former United States Secretary of Defense Robert McNamara stated that several unspecified officials ("Chiefs") within The Pentagon were opposed to a Nuclear Test Ban Treaty between the United States and the Soviet Union, on the premise that the Soviets would continue nuclear weapons testing on the far side of the Moon, far from the observations of American observers. McNamara considered this premise "absurd" and that "[they were] out of [their] minds," but he believed that it was an example of the state of mind of some Pentagon officials during the Cold War. Ironically, it was later revealed that the Pentagon had their own plan to detonate a nuclear weapon on the Moon as part of the experiment Project A119. The project was created not only to help in answering some of the mysteries in planetary astronomy and astrogeology, but also as a show of force intended to boost domestic confidence in the astro-capabilities of the United States, a boost that was thought to be needed after the Soviet Union took an early lead in the Space Race and who were thought by some to be working on a similar project. ^ a b Sigurdsson, Steinn (2014-06-09). "The Dark Side of the Moon: a Short History". Retrieved 2017-09-16. ^ a b O'Conner, Patricia T.; Kellerman, Stewart (2011-09-06). "The Dark Side of the Moon". Retrieved 2017-09-16. ^ a b Messer, A'ndrea Elyse (2014-06-09). "55-year-old dark side of the moon mystery solved". Penn State News. Retrieved 2017-09-16. ^ a b Falin, Lee (2015-01-05). "What's on the Dark Side of the Moon?". Retrieved 2017-09-16. ^ "Chinese spacecraft makes first landing on moon's far side". AP NEWS. 2019-01-03. Retrieved 2019-01-03. ^ Kenneth Silber. "Down to Earth: The Apollo Moon Missions That Never Were". ^ "Dark No More: Exploring the Far Side of the Moon". 29 April 2013. ^ J. J. Gillis; P. D. Spudis (1996). "The Composition and Geologic Setting of Lunar Far Side Maria". Lunar and Planetary Science. 27: 413. Bibcode:1996LPI....27..413G. ^ a b c d Ley, Willy (April 1966). "The Re-Designed Solar System". For Your Information. Galaxy Science Fiction. pp. 126–136. ^ M. Jutzi; E. Asphaug (2011). "Forming the lunar farside highlands by accretion of a companion moon". Nature. 476 (7358): 69–72. Bibcode:2011Natur.476...69J. doi:10.1038/nature10289. PMID 21814278. ^ Near-side/far-side impact crater counts by David Morrison and Brad Bailey, NASA. http://lunarscience.nasa.gov/?question=3318. Accessed Jan 9th, 2013. ^ Messer, A'ndrea Elyse (2014-06-09). "55-year-old dark side of the moon mystery solved". Penn State University. Retrieved 2016-06-27. ^ "How much moon do we see? | EarthSky.org". earthsky.org. Retrieved 2019-02-06. ^ "NASA - NSSDCA - Spacecraft - Details". nssdc.gsfc.nasa.gov. ^ Launius, Roger D. "Aeronautics and Astronautics Chronology, 1960". www.hq.nasa.gov. ^ "Sphæra: the Newsletter of the Museum of the History of Science, Oxford". www.mhs.ox.ac.uk. ^ "Page not found - Adler Planetarium". Adler Planetarium. ^ "Works of the Department of lunar and planetary research of GAISh MGU". selena.sai.msu.ru. ^ "Discussion". Space Policy. 14 (1): 5–8. 1998. doi:10.1016/S0265-9646(97)00038-6. ^ "Chinese spacecraft makes first landing on moon's far side". Times of India. Associated Press. 3 January 2019. Retrieved 3 January 2019. ^ "China aims to land Chang'e-4 probe on far side of moon". Xinhua English News. 2015-09-08. Archived from the original on 2015-09-10. ^ Stenger, Richard (2002-01-09). "Astronomers push for observatory on the moon". CNN. Archived from the original on 2007-03-25. Retrieved 2007-01-26. ^ M. B. Duke; B. C. Clark; T. Gamber; P. G. Lucey; G. Ryder; G. J. Taylor (1999). "Sample Return Mission to the South Pole Aitken Basin" (PDF). Workshop on New Views of the Moon 2: Understanding the Moon Through the Integration of Diverse Datasets: 11. ^ "Thar's Gold in Tham Lunar Hills". Daily Record. 2006-01-28. Retrieved 2007-01-26. ^ Schmitt, Harrison (2004-12-07). "Mining the Moon". Popular Mechanics. Archived from the original on 2013-10-07. Retrieved 2013-10-07. ^ "What's on the Far Side of the Moon?". Paranormal.about.com. 2013-12-19. Retrieved 2014-01-05. ^ "UFOs on the Moon 1". Ufos.about.com. 1968-12-24. Archived from the original on 2013-10-23. Retrieved 2014-01-05. ^ "Answered Question « Ask an Astrobiologist « NASA Astrobiology". 9 September 2012. Archived from the original on 9 September 2012. ^ The Fog of War, Errol Morris, 2003. Retrieved, Oct. 19, 2013. ^ U.S. had plans to nuke the moon., CNN Nov. 28, 2012. Retrieved, Oct 21, 2013. ^ a b c d e "Chang'e-4's moon landing site named". China Daily. 17 February 2019. Retrieved 16 February 2019. ^ a b c d e "IAU Names Landing Site of Chinese Chang'e-4 Probe on Far Side of the Moon". International Astronomical Union. 15 February 2019. LIFE magazine (Nov. 9, 1959) article about first photos.